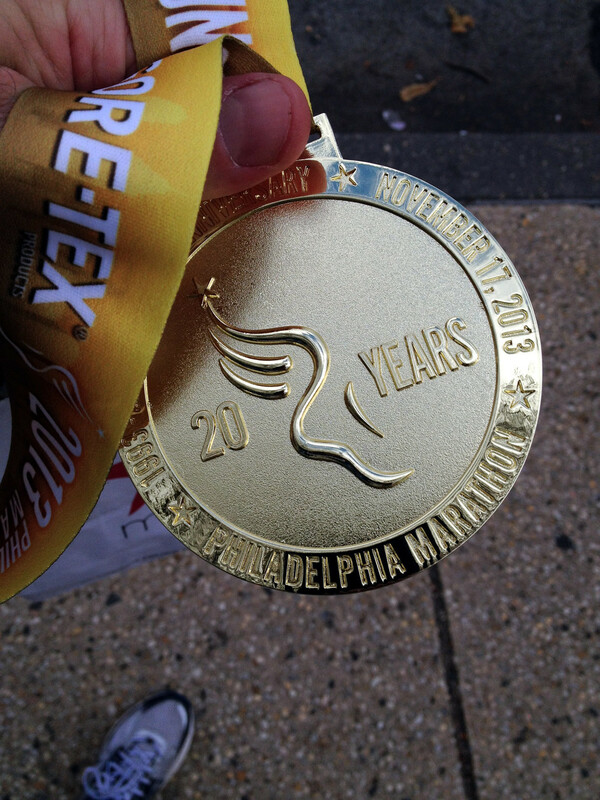 20th Anniversary Philadelphia Marathon Finisher's Medal. I ran the Philadelphia marathon on Sunday, November 17, 2013 and had a blast. My goal was to finish in under 5 hours. When I last ran the Philly marathon, I came in at 5 hours and 6 minutes so I thought that I would be good. But it was not to be. The temperature for the race was around 66 degrees when I finished and the heat did me in. Not enough to drink and fatigue zapped my strength. At mile 18, I saw the 5 hour pace group catch up to me and then pass me by. For a while, I struggled to keep up with the group and their leader holding the sign that read 5:00 on it, but I had a moment of zen. I had a chance to make. The Philadelphia marathon was the second marathon I had run in 2013 with the first taking place in April. Training for the marathon takes 4 months so I had spent 8 months of training for marathons in 2013. I had put a lot on the back burner (more on that in a bit) and as the pace group faded in front of me I saw my goal fall away. The moment of zen that I had went like this: "Hey, you feel dehydrated and like crap. If you push yourself too hard, you're going to throw up, collapse and be dragged off the course. Not only will you not make 5:00 but you'll not even finish the race." I listened to my voice of reason and stopped. For the last 8 miles, I walked and ran toward the finish. I decided not to hurt myself and eased up. I thought of my family waiting for me and knew that they would want me safe rather than fast. And I had raised $1100 for Alex's Lemonade Stand Foundation (the online form is still open if you'd like to help!) and I had promised a good many people who believed in me that I would finish the race. I chose to run the race to raise funds for children sick with cancer. The money I raised would go toward grants to help fund research to find cures and treatments to fight pediatric cancers. All of this swirled through my mind and I slowed down. Yes, I wasn't too happy about failing to meet my running goal, but that is how life is sometimes. You work really hard and you still can't make the goal you want. How you respond to the challenge is what matters. For me, I had a pretty interesting race. Thankfully, I was able to turn the situation around and think about the position things. About a mile into the first half of the race, a woman came up to me and said hello. She told me that she had been following me for the last mile because she and I had the same pace and wondered if it would be okay to run with me. In all the races I have run, I have never run with anyone. I like running alone and do better that way. But I took up her offer and my experience in the first part of the race was totally different. She talked about her kids, her partner and we laughed at the various signs we saw people holding up for us as we ran by. "You're running better than the government does" was one of my favorites. At mile 12, her partner ran up to her and gave her a big hug. I took her partner's iPhone and took a few pictures (we were all still running), gave the phone back and waved to them. It was the first time I acted as a pacer for someone, helping her stay on her target to finish her first half marathon. The experience was unique and it's not every day that I run with someone different than myself. I thoroughly enjoyed that part of the race. The second part of the race became a test of wills for me. The heat beat me down, I fought to not lose what little I had left in my stomach and I desperately tried get more to drink. I watched all the people in the bars in Manayunk eat and drink the day away as thousands of runners passed them by. I saw drunk women offering beer to runners and acting all sloping as we ran by. I saw two women who were completing their 50 marathon in all 50 states but I also saw a young woman on crutches "running" the race. Every person who ran had their own story and the thousands of people who came out to cheer had their own as well. When I accepted that I could not keep up my pace, I walk/ran the rest of the way and I saw so many interesting sites. I took in the experience and watched old and young pass me by. I remained determined to finish. My time would be off but I would finish (and I did). It took me 5 hours and 22 minutes to finish 26.2 miles. Right before mile 26 I saw my wife and kids. I picked up the pace and ran strong past them as they cheered. The night before I had talked to my son and told him how afraid I was of the race. I feared that I would fail and not be able to do it. I wanted him to know that his father was human and had fears just like he does. But I would stand up, face my fear and run. And run I did. Yes, I did more walking than I would have liked, but I finished. When I ran to the finish, I could hear the people cheering, the music blaring and I remember putting my hands together in prayer and thanking God that I had made it. I stopped and a wave of emotion washed over me. Months of training, getting up before dawn, running 10 miles before work in the dark. Running at night. Stretching, being grumpy, tired, hurting--all of this hit me at once. I had fought hard and I accepted the fact that I had not made my goal. But I did complete the race and I had raised a good amount of money for children with cancer. After the race was over, I walked through the finish chute, wrapped the space blanket around me and accepted my medal. (My first thought: Damn, this medal is way too big and gaudy.) I accepted a bottle of water and then had a moment of bliss: I took a small cup of chicken broth and its warmth spread through me. The pain, the emotion and all that I had sacrificed over the last four months was now done and over. I accepted where I was, what I had done and all the support from my wife and family. Now I needed to give back and re-evaluate. Much had been put on hold. With the marathon in the books, I have more time for my family and on a personal level I now have time to finish my novel. Book 3 of Cinderella's Secret Diaries I'm looking at you. I've 65 pages left to rewrite. With no more 4 mile training runs on Sunday morning, imagine what I could now do! But on a serious note: The marathon was hard and it beat me down. I'm humbled by the experience. Will I do another? Most likely yes, but probably not for another year or two. In the meantime, I have a lot of catching up to do with the rest of my life. On November 17 I'm running the 2013 Philadelphia marathon and have decided to help raise money for Alex's Lemonade Stand Foundation whose mission is to fund research to promote new treatments for childhood cancers. What has always inspired me with ALSF is that one little girl who was dying of cancer put so much effort into helping others. If Alex could work so hard before she died to help others, why couldn't I help as well? This will be my second time running the Philadelphia marathon. For this year, I wanted to continue to support ALSF by raising $1,000 to support pediatric cancer research. I ask that you please make a donation to the ALSF. And if you are unable to make a donation, then please tweet, put on Facebook or email my official ALSF donation page to your friends and family. Thank you for your support!